Stocks slid after another turbulent week, buffeted by more worries about China. Investors chose to remain cautious ahead of the long Labor Day weekend and a raft of fresh data out of China. For the week, the S&P 500 lost 3.40%, the Dow fell 3.25%, and the NASDAQ dropped 2.99%. Markets stayed pessimistic last week as traders decided to stay cautious during a four-day Chinese holiday and ahead of the U.S. Labor Day market holiday. This week is packed with more economic data out of China that may shed more light on the current situation. China's central bank governor hinted at possible stimulus measures designed to help boost economic activity, suggesting that Chinese leaders are ready to get aggressive about their economic woes. On the domestic side, the August jobs report showed that the economy added 173,000 new jobs last month, pushing the unemployment rate to 5.1%. While the job creation number is lower than expected, the silver lining is that wage growth is increasing. After posting tepid gains earlier this year, wages increased by 2.4% in August, suggesting that employers are nudging paychecks higher to attract workers. If the trend persists, it could indicate that the labor market recovery is on track. Next week's Federal Reserve Open Market Committee meeting could kick the market out of its volatile pattern. The big question everyone is asking is: Will the Fed make a move on interest rates when markets are so uncertain? Even with all the recent volatility, a recent survey of economists shows that the vast majority think the Fed will hike rates at next week's meeting. 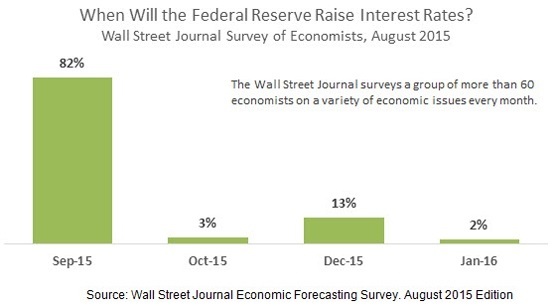 Last week's jobs report could give the Fed the ammunition it needs to raise interest rates. On the other hand, Fed officials could wait longer to give markets more time. If a rate move happens, it will signal that the Fed believes the U.S. economy is on the right path, regardless of what may be happening overseas. Right now, markets are in turmoil because of uncertainty. Investors hate uncertainty and tend to react by selling first and asking questions later. Hopefully, once the dust around China settles, investors will see that the U.S. economy has legs and will start making decisions that are based on logic and not fear. While we can hope that a decision by the Fed will give investors the certainty they seek, it's possible that markets could be in for more turbulence. As always, we'll be keeping a very close watch on market movements. Motor vehicle sales surge in August. Despite a late Labor Day (cutting into August sales numbers), U.S. automakers posted big gains, achieving the strongest results since July 2005. Construction spending booms in July. Spending on construction activity reached a seven-year high in July, increasing by 13.7% as compared to July 2014. Factory orders increase in July. New orders for U.S. manufactured goods rose for a second straight month in July, indicating that demand remains strong despite a higher dollar and soft global demand. Mortgage applications soar on rate dip. The broad selloff in the stock market briefly pushed interest rates lower, sparking a surge in mortgage applications. Application volume surged 11.3% as compared to the week prior, putting applications up by 30% as compared to the same time last year.